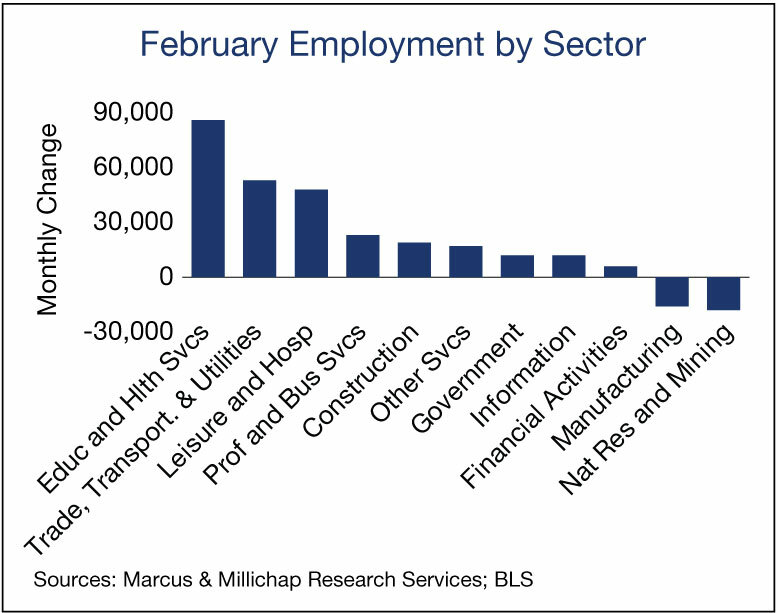 Employers demonstrated the strength of the U.S. labor market in February as it continued to shrug off lingering global economic uncertainty and softness in oil and gas industries. Jobs were created in multiple service sectors of the economy and at government agencies during the month, helping to maintain gauges of labor market capacity at tight levels. While wage growth continues to search for a stimulus that will impart greater traction, the U.S. labor market nonetheless appears in sound condition in advance of a Federal Reserve meeting in March. U.S. employers added 242,000 positions in February, and upward revisions were made to the preceding two months. Job growth during February also left the unemployment rate unchanged but reduced the under-employment rate to 9.7 percent, the lowest reading in nearly eight years. Employment sectors requiring considerable interaction with consumers grew substantially during the month. Recently hired employees continue to land on healthcare rolls, supporting a gain of approximately 57,000 healthcare workers. Retailers, meanwhile, created nearly 55,000 jobs, primarily at food and beverage stores, while changes in lifestyles that favor dining out supported hiring at bars and restaurants that accounted for most of the 48,000 leisure and hospitality jobs created. A sizable volume of multifamily and hotel projects, and a resurgence in other commercial property development, is spurring growth in construction payrolls. Builders brought on 19,000 new employees in February, primarily in subcontracting trades. Despite the gain, a shortage of workers leaves subcontractor employment nearly 700,000 positions below the pre-recession peak, thereby straining the ability of developers to staff new projects and placing upward pressure on costs. An index of construction costs rose in February and is up 2.2 percent from one year earlier. Elevated completions will place upward pressure on U.S. apartment vacancy in 2016, while the rising costs of building will sharpen developers’ focus on higher-end, amenity-rich projects that offer returns that align with the required investment. Class A apartment construction in a few major metros will account for a large portion of the 285,000 units slated for delivery this year and contribute to an uptick in national vacancy to 4.2 percent. Dallas/Fort Worth, Houston and New York City headline the list of major metros due for significant supply growth this year. Professional and business services, and financial services maintained a steady pace of growth in February, adding a combined 29,000 positions. As new workers are hired, the amount of underutilized spaces in office buildings continues to dwindle. Further staff expansions may necessitate a reconsideration of tenants’ space requirements, providing a lift to space demand as leases for larger layouts are executed and move-ins take place. New space demand will trim U.S. office vacancy to 14.8 percent in 2016, while the average rent will increase 3.9 percent. This entry was written by marcusmillichap, posted on March 8, 2016 at 9:35 pm, filed under Uncategorized. Bookmark the permalink. Follow any comments here with the RSS feed for this post. Post a comment or leave a trackback: Trackback URL.